Protecting your business from a fire hazard is crucial, because all of the money, time, and effort that you poured into the business has the potential of disappearing in one blaze. Even if fire safety is not one of the top priorities of your business, the law still expects you to meet minimum standards in this regard. Protecting against fire is more than the existence of a fire extinguisher and automatic water sprinkler. The overall design of your building will determine how resistant it is against a fire hazard. This design must be in accordance with the principles of Passive Fire Protection (PFP). Ensure that your commercial building is made with fireproofing material, such as spray-on thin-film instumescents, endothermic materials, or concrete. There should also be fire walls, fire barriers, fire partitions, as well as smoke barriers. Walls should extend from a fire rated floor to a fire rated ceiling above and also reach into hidden spaces for complete protection. These barriers are designed to contain the spread of a fire. Fire doors and windows should be placed at the opening of a fire barrier to add to the resistance. You should also have the basic fire safety equipment such as a fire extinguisher. Although this is also part of the infrastructure, it is worth exploring in greater detail as it is considered to be the first line of defence against a fire hazard. The fire alarm is what alerts everyone to the possible presence of a fire, and facilitates a timely evacuation. Your fire alarm should be maintained and inspected on at least an annual basis. There should also be regular fire drills to reinforce whatever fire drill protocols are in place. You should have emergency generators that will kick in to supply power for lighting. These lights should clearly mark all emergency exits and make exit signs visible. These generators should be tested regularly as well. There should be a culture of fire safety among employees and all personnel should be familiar with safety policy and procedures with regards to fire. For example, all staff should be aware that fire exits should be kept clear at all times. The fire extinguisher is perhaps the most visible mark of fire safety, and the location and accessibility of the fire extinguisher will have a large impact on how effective it proves to be. Generally, a person should not have to travel more than 75 feet to reach a fire extinguisher. The fire alarm system is designed to notify occupants to get out of the building. On its own, it does not let the fire department know that an alarm has sounded. 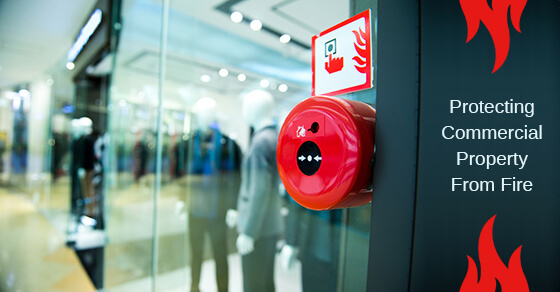 Maintaining fire alarm or sprinkler monitoring in conformance with CAN/ULC-S561 will ensure that you meet all applicable codes and the fire department is notified of any alarms that sound. It is best to employ the services of an inspector to ensure that your equipment is in proper condition. If there are any defects you will be informed about it before it’s too late.